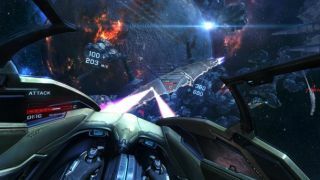 The space combat sim EVE: Valkyrie is a particularly exciting addition to the genre because it's being built from the ground-up to use the Oculus Rift VR headset. Assuming it lives up to the hype, that will make it one of the most uniquely immersive gaming experiences available, as players will have complete freedom of view through their cockpit windows as they yank-and-bank across the galaxy. But despite that great potential, executive producer Owen O'Brien doesn't believe it will herald a new generation of similarly engaging FPSes. "Virtual reality for everything!" may well be where the videogame industry ends up, but it's got a long way to go to get there, according to O'Brien. The trouble is that while VR headsets bring your eyes into a virtual world, the rest of your body is stuck in the real one. "The basic problem is Simulator Sickness. In Valkyrie or any cockpit game or driving game, what you're doing in the real world, assuming you're sitting down, more or less mimics what your brain is telling you you're doing in the game. So you don't get that disconnect, and it's that disconnect that causes sickness," he said in an interview with Red Bull . "The problem with first-person shooters is that you're running or crouching or jumping in the game but not in the real world, and because it's so realistic it can make some people (not everybody) feel nauseated if they start doing it for extended periods of time." The other problem, he continued, is that gamers are "kind of hard-wired" to the idea of looking, moving and shooting in the same direction at the same time. "None of this is unsolvable – these are just the challenges [of VR]," he said. "And it's not just FPSes: It's anywhere where you're doing something in the game that deviates dramatically from what your body is telling you you're doing." A more detailed breakdown of "simulator sickness" is available on Wikipedia , which describes it as a sort of reverse motion sickness caused by "perceived discrepancies between the motion of the simulator and that of the vehicle," or, in the case of FPSes, the individual. Piling on more peripherals could help eliminate the perceptual gap but of course that would add complexity and expense, too. O'Brien said he's "sure there's an interesting solution that nobody's thought of yet," but until someone figures out what it is, VR shooters will remain a long way off.